Simunition is known throughout the world for it's leadership in non-lethal, short-range training ammunition solutions. Their mission is "to provide the most realistic training systems possible so that officers, military forces and approved range members around the world can engage in experience building and ultimately lifesaving exercises." Lately, Simunition has been working on expanding it's training methods by partnering with FitLight to create a high-tech tactical training system. Check out our blog post featuring the FitLight system here. The FX® training system which is comprised of FX® marking cartridge, weapon conversion kit and protective equipment. All three essential components are supported by a comprehensive Simunition® Scenario and Safety Certification Training Course. This is the ultimate force-on-force training system. The SecuriBlank® system which is comprised of SecuriBlank® cartridge - a truly safe blank, and a weapon conversion kit. "The FX® system is comprised of FX® marking cartridges, weapon conversion kits and personal protective equipment. All three essential components are supported by a comprehensive Simunition® Scenario and Safety Certification Training Course." Learn more. 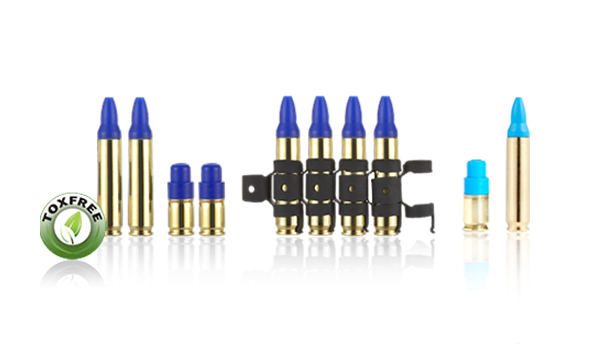 "These reduced-energy cartridges are designed to use the Simunition® conversion kit. SecuriBlank® Loud feature reduced propellant charge. These cartridges produce realistic recoil, and are safer because they virtually eliminate unburnt propellant and ejected particles. SecuriBlank® Loud cartridges are affordable and convenient for training any time, any place, indoors or outdoors." "The SecuriBlank® Quiet Blank round allows for training at extreme close ranges without the effects such as muzzle blast and excessive noise levels. This environmentally friendly cartridge, free of any heavy metals is safe for you and the environment. With no gas discharge, our SecuriBlank® Quiet can be shot at very close range without damaging human tissue or even paper. It is truly the safest and cleanest blank available today. The SecuriBlank® Quiet will revolutionize the way Concealed Carry Weapon Instructors conduct training in the classroom." Learn more about the SecuriBlank® training system here. "The FX® line of protective equipment consists of three mandatory protective items: the helmet or the facemask for use with Kevlar helmets, the neck protector and the groin protector. The arm protectors, vest, gloves, pants and sleeves are optional. FX® protective equipment, which is Simunition® tested and approved, is comfortable, breathable and lightweight, allowing the user to move freely and naturally." Learn more. Newer PostExclusive Offers from TSSi! Older PostHappy Fourth of July from TSSi!